With eight retirements, seven on the men's side, in the opening round of Wimbledon, the debate over whether injured players are simply turning up for their first round prize money when they are clearly not fit enough to play has reared its head again. There are two real concerns that people have with all of the retirements. Firstly, many fans seem to object to players simply turning up to collect their money with no real intention of being able to play a proper match. Secondly, there is the issue of not being able to see full matches of tennis being played. This second issue was particularly pertinent today with two of the retirements coming in back-to-back matches on Centre Court, where people had paid expensive prices for tickets or queued for huge periods of time to get those tickets. Let us first address a couple of suggested solutions for the first of those issues. There have been suggestions that players should not be given any prize money if they do not complete their first round match. This would probably solve some of the retirements, but it is likely to simply lead to players just hanging around on court to see out the rest of the match without putting up any challenge. This would likely just lead to those same people that complained about the retirements complaining about players not putting in the effort. It also seems to unfairly penalise those players that suffer genuine injuries during a match. It seems quite harsh to take away the £35k prize money that Anastasia Potapova would get after she had a nasty fall when leading by a break in the second set. For a player that has a total career prize money of just under $16k, the prize money from Wimbledon is a huge deal. There have also been suggestions of deducting a portion of prize money if you withdraw and also deducting prize money for tanking. In a perfect world, this could work, but how you would decide how much prize money to withdraw for a retirement would be tricky. Do you withdraw the same amount for a retirement in the second set as one in the fourth set? What if a player is leading by two sets, but gets injured? In addition, I am strongly against the idea of deducting prize money for tanking, simply due to the difficulty of determining whether a player is tanking. If a player is struggling with injury and decide that they cannot run to retrieve balls, is that tanking? If they decide that the best strategy given their injury is to look to hit winners early in every point and miss a lot of them, is that tanking? Something that could be the best strategy, but which is executed poorly, can easily look like a player does not care. There is the argument that players should just withdraw before the match if they are not certain that they can finish the match. Again, that is a lovely idea, but players work for a year to earn their ranking and, for many players, the aim is to get their ranking to the point that they gain direct entry into the slams for the prize money that comes with that. Let us take Janko Tipsarevic. He has been grinding away on the Challenger Tour for much of 2017, playing events in places like Bangkok, Qingdao and Anning to get his ranking up to the point where he can get direct entry into Wimbledon. He has played 32 matches in 2017 to earn his ranking and has earned $160k (around £120k). He stated that he felt pain in practice and was assured by the doctors that the injury was not serious. He was given injections and the injury felt better. He then went out on court today and the pain came back in the third game of the match. The idea that he should have withdrawn beforehand because he had some pain that might have caused issues in the match and forgo the prize money that is equivalent to over 25% of what he has earned in the six months leading up to this is crazy. However, when there is pain during a match, there is always the question of whether playing on might aggravate the injury and extend any period of recovery. Another solution that has been suggested is to reduce the prize money for the first round to reduce the temptation to simply turn up for the money. Ignoring the fact that the tour would almost certainly face a player mutiny if they tried to significantly reduce first round prize money, it arguably penalises a significant number of players that rely on the money for their career for the sake of solving a small issue. In 2017, the ATP have been trialling a new system on the tour. This is where a player that withdraws before a first round match is still given the prize money and is replaced in the draw by a lucky loser. The lucky loser does not get any prize money if they lose in the first round, but if they progress, they gain whatever points and money they would expect from progressing through the rounds. 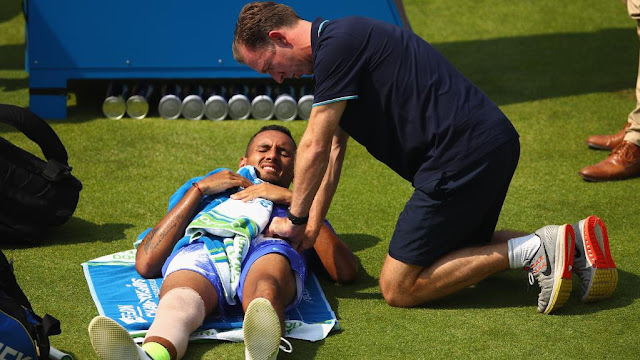 The idea is that players that have an injury that might prevent them from completing the match have the incentive to withdraw and it gives the crowd an increased opportunity to see a full match, while it give the opportunity to a lucky loser that would not have otherwise been the case. The restructuring of the lucky loser system was important alongside this to prevent the highest ranked player in qualifying from simply tanking his final qualifying match knowing that he was already in the main draw though. This system also helps to add a potential layer of protection against corruption as it lessons the chance that a player goes onto the court knowing that they cannot win. Has this had much of an impact? Excluding the slams, there have been 18 first round retirements in 556 matches so far in 2017, meaning that there is a retirement in 3.2% of matches. In the past three seasons (2014-2016), there were 106 retirements in 2740 first round matches, which works out at 3.9% of matches ending in retirement. It is a valid argument that there may be more retirements later in the season, so comparing the first half of this season to full seasons previously is not fair. If we simply look at all of the tournaments pre-Wimbledon in the past three seasons, the rate of retirements does drop slightly from 3.9% to 3.6%, but still higher than in the current season. Is this enough of a change to say that the system is working? Probably not at this stage, but it is a promising start and there is an argument to suggest that this could be implemented in slams. You will still get people complaining that players are collecting prize money without even picking up a racket, but they have earned their place in the draw through the past year's tennis and it can be argued that they have earned the prize money. It should also lead to fewer retirements and more tennis for the spectators at the event and for fans watching on television. The matches may not be any more competitive, particularly against the top players, but at least there is a significantly higher chance of getting more tennis played. Is it an ideal solution? Maybe not. Is there an ideal solution? Almost certainly not. Every solution that has been raised has flaws and there is no solution that everyone will be happy with. Ultimately though, the chief aim for tournaments and the ATP really should be to maximise the tennis product that they offer and a solution that gets more healthy players on court and more tennis played surely must be an improvement? Would be interesting with a follow up on retirement frequency after the rule change. Double the number of qualifiers in the MD to 32. Have 192 players in qualifying, each qualifying spot is contested by 6 players of which 2 are seeded and get a bye. This way, both qualifying and the main draw will be more competitive and offer better entertainment.